Parsl scripts can be executed on different execution providers (e.g., PCs, clusters, supercomputers) and using different execution models (e.g., threads, pilot jobs, etc.). Parsl separates the code from the configuration that specifies which execution provider(s) and executor(s) to use. Parsl provides a high level abstraction, called a block, for providing a uniform description of a resource configuration irrespective of the specific execution provider. Refer to Configuration for information on how to configure the various subsystems described below for your workflow’s resource requirements. Execution providers are responsible for managing execution resources. In the simplest case a PC could be used for execution. For larger resources a Local Resource Manager (LRM) is usually used to manage access to resources. For instance, campus clusters and supercomputers generally use LRMs (schedulers) such as Slurm, Torque/PBS, HTCondor and Cobalt. Clouds, on the other hand, provide APIs that allow more fine-grained composition of an execution environment. Parsl’s execution provider abstracts these different resource types and provides a single uniform interface. LocalProvider: The provider allows you to run locally on your laptop or workstation. CobaltProvider: This provider allows you to schedule resources via the Cobalt scheduler. SlurmProvider: This provider allows you to schedule resources via the Slurm scheduler. CondorProvider: This provider allows you to schedule resources via the Condor scheduler. GridEngineProvider: This provider allows you to schedule resources via the GridEngine scheduler. TorqueProvider: This provider allows you to schedule resources via the Torque scheduler. AWSProvider: This provider allows you to provision and manage cloud nodes from Amazon Web Services. GoogleCloudProvider: This provider allows you to provision and manage cloud nodes from Google Cloud. JetstreamProvider: This provider allows you to provision and manage cloud nodes from Jetstream (NSF Cloud). KubernetesProvider: This provider allows you to provision and manage containers on a Kubernetes cluster. Depending on the execution provider there are a number of ways to execute workloads on that resource. For example, for local execution a thread pool could be used, for supercomputers pilot jobs or various launchers could be used. Parsl supports these models via an executor model. Executors represent a particular method via which tasks can be executed. As described below, an executor initialized with an execution provider can dynamically scale with the resource requirements of the workflow. ThreadPoolExecutor: This executor supports multi-thread execution on local resources. IPyParallelExecutor: This executor supports both local and remote execution using a pilot job model. The IPythonParallel controller is deployed locally and IPythonParallel engines are deployed to execution nodes. IPythonParallel then manages the execution of tasks on connected engines. HighThroughputExecutor: [Beta] The HighThroughputExecutor is designed as a replacement for the IPyParallelExecutor. Implementing hierarchical scheduling and batching, the HighThroughputExecutor consistently delivers high throughput task execution on the order of 1000 Nodes. ExtremeScaleExecutor: [Beta] The ExtremeScaleExecutor uses mpi4py to scale over 4000+ nodes. This executor is typically used for executing on Supercomputers. Swift/TurbineExecutor: [Deprecated] This executor uses the extreme-scale Turbine model to enable distributed task execution across an MPI environment. This executor is typically used on supercomputers. These executors cover a broad range of execution requirements. As with other Parsl components there is a standard interface (ParslExecutor) that can be implemented to add support for other executors. Refer to Configuration for information on how to configure these executors. SrunLauncher: Srun based launcher for Slurm based systems. AprunLauncher: Aprun based launcher for Crays. SrunMPILauncher: Launcher for launching MPI applications with Srun. GnuParallelLauncher: Launcher using GNU parallel to launch workers across nodes and cores. MpiExecLauncher: Uses Mpiexec to launch. SimpleLauncher: The launcher default to a single worker launch. SingleNodeLauncher: This launcher launches workers_per_node count workers on a single node. Providing a uniform representation of heterogeneous resources is one of the most difficult challenges for parallel execution. Parsl provides an abstraction based on resource units called blocks. A block is a single unit of resources that is obtained from an execution provider. Within a block are a number of nodes. Parsl can then execute tasks (instances of apps) within and across (e.g., for MPI jobs) nodes. Three different examples of block configurations are shown below. 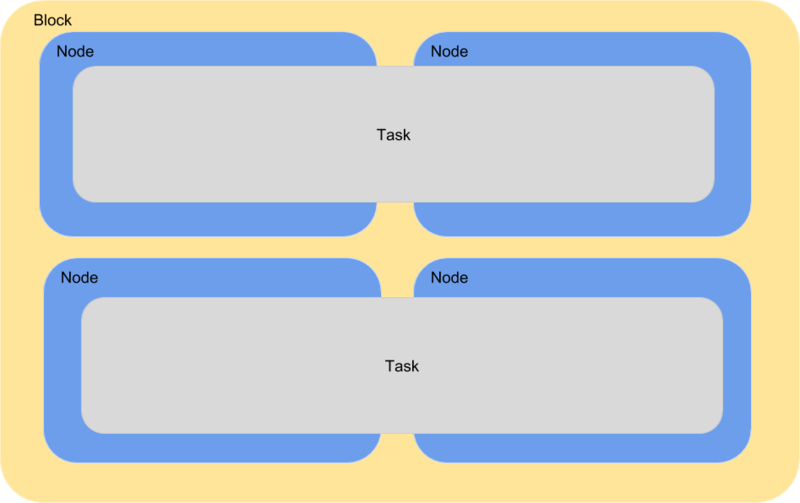 A single block comprised on a node executing several tasks. This configuration is most suitable for single threaded apps running on multicore target systems. The number of tasks executed concurrently is proportional to the number of cores available on the system. A block comprised of several nodes and executing several tasks, where a task can span multiple nodes. This configuration is generally used by MPI applications. Starting a task requires using a specific MPI launcher that is supported on the target system (e.g., aprun, srun, mpirun, mpiexec). Parsl implements a dynamic dependency graph in which the graph is extended as new tasks are enqueued and completed. As the Parsl script executes the workflow, new tasks are added to a queue for execution. Tasks are then executed asynchronously when their dependencies are met. Parsl uses the selected executor(s) to manage task execution on the execution provider(s). The execution resources, like the workflow, are not static: they can be elastically scaled to handle the variable workload generated by the workflow. During execution Parsl does not know the full “width” of a particular workflow a priori. Further, as a workflow executes, the needs of the tasks may change, as well as the capacity available on execution providers. Thus, Parsl can elastically scale the resources it is using. To do so, Parsl includes an extensible flow control system that monitors outstanding tasks and available compute capacity. This flow control monitor, which can be extended or implemented by users, determines when to trigger scaling (in or out) events to match workflow needs. The animated diagram below shows how blocks are elastically managed within an executor. The script configuration for an executor defines the minimum, maximum, and initial number of blocks to be used. min_blocks: Minimum number of blocks to maintain per executor. init_blocks: Initial number of blocks to provision at initialization of workflow. max_blocks: Maximum number of blocks that can be active per executor. workers_per_node: Number of workers started per node, which corresponds to the number of tasks that can execute concurrently on a node. nodes_per_block: Number of nodes requested per block. Parsl provides a simple user-managed model for controlling elasticity. It allows users to prescribe the minimum and maximum number of blocks to be used on a given executor as well as a parameter (p) to control the level of parallelism. Parallelism is expressed as the ratio of task execution capacity and the sum of running tasks and available tasks (tasks with their dependencies met, but waiting for execution). A parallelism value of 1 represents aggressive scaling where as many resources as possible are used; parallelism close to 0 represents the opposite situation in which as few resources as possible (i.e., min_blocks) are used. By selecting a fraction between 0 and 1, the aggressiveness in provisioning resources can be controlled. When p = 0: Use the fewest resources possible. When p = 1: Use as many resources as possible. When p = 1/2: Stack up to 2 tasks before overflowing and requesting a new block. The animated diagram below illustrates the behavior of this executor. 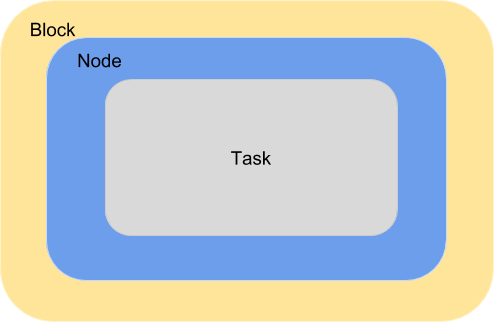 In the diagram, the tasks are allocated to the first block, until 5 tasks are submitted. At this stage, as more than double the available task capacity is used, Parsl provisions a new block for executing the remaining tasks. Parsl supports the definition of any number of executors in the configuration, as well as specifying which of these executors can execute specific apps. The workflow has an initial simulation stage that runs on the compute heavy nodes of an HPC system followed by an analysis and visualization stage that is better suited for GPU nodes. The workflow follows a repeated fan-out, fan-in model where the long running fan-out tasks are computed on a cluster and the quick fan-in computation is better suited for execution using threads on the login node. The workflow includes apps that wait and evaluate the results of a computation to determine whether the app should be relaunched. Only apps running on threads may launch apps. Often, science simulations have stochastic behavior and may terminate before completion. In such cases, having a wrapper app that checks the exit code and determines whether or not the app has completed successfully can be used to automatically re-execute the app (possibly from a checkpoint) until successful completion. The following code snippet shows how executors can be specified in the app decorator.